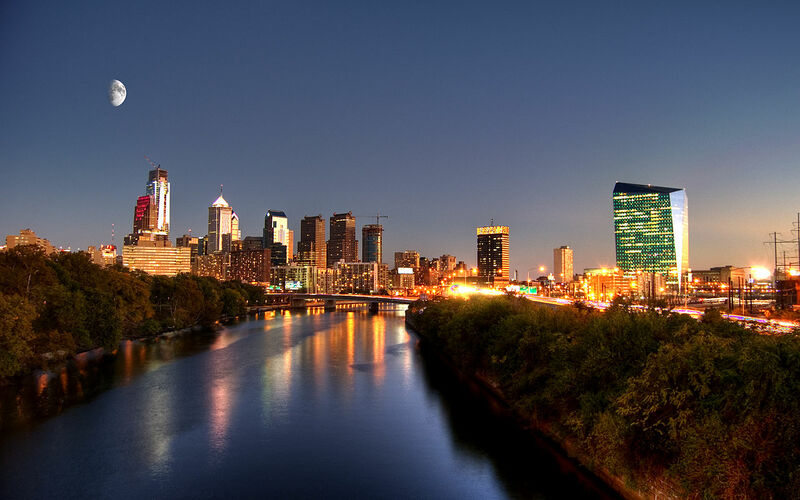 The city of Philadelphia, as laid out by William Penn, comprised only that portion of the present city situated between South and Vine Streets and Delaware and Schuylkill Rivers. In fact, the city proper was that portion between High (Market) Street and Dock Creek. Here is where the pioneers dug caves in the banks of the Delaware or built huts on the land higher up. Meanwhile, the women equally busy in their sphere, had lighted their fire on the bare earth, and having "their kettle slung between two poles upon a stick transverse," thus prepared the meal of homely and frugal fare for the repast of diligent builders. Native Americans were more or less present, either as spectators of the improvements then progressing, or, venders of their game and venison from the neighboring wilds. The Swedes and Dutch, who were the earliest settlers, as neighbors, brought their productions to market as a matter of course. Settlements were made, however, outside of these boundaries, and in the course of time they became separately incorporated and had separate governments, making congeries of towns and districts, the whole group being known abroad simply as Philadelphia. Several of these were situated immediately contiguous to the "city proper": Southwark and Moyamensing in the south, and Northern Liberties, Kensigton, Spring Garden and Penn District to the north, and West Philadelphia to the west — all of which were practically one town continuously built up. Please support UShistory.org Click Here !